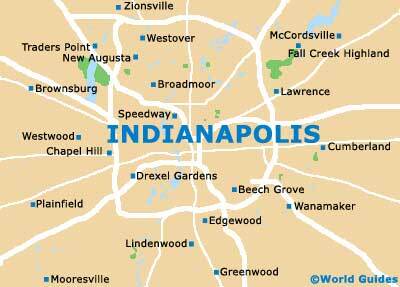 Indianapolis is a city with many attractive churches, a number of which are listed buildings with important pedigrees and sizeable congregations. 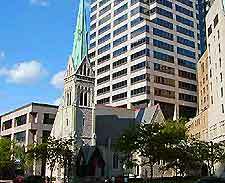 There are no less than three cathedrals located within the boundaries of Indianapolis, with Christ Church Cathedral being the oldest and serving as the seat of the city's Episcopal Diocese. Slightly younger is the Saints Peter and Paul Cathedral, which was built between the years of 1905 and 1907 and is the seat of the Roman Catholic Archdiocese. Finally, the Scottish Rite is younger still, being completed in 1929 and costing more than $2.5 million to build. Even today, many architects still consider the Scottish Rite to be one of America's finest Neo-Gothic buildings. Christ Church Cathedral was built in the 1850s, when it replaced an older wooden building, and is now the only remaining church on Monument Circle. 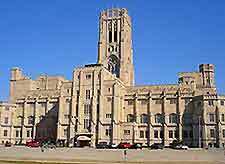 Standing close to modern high-rise structures, the cathedral comprises no less than three different types of limestone and is now listed on the National Register of Historic Places. The Saints Peter and Paul Cathedral was built in the early part of the 20th century and is a Roman Catholic church, with intricate period features, many regular churches and seasonal festivals. Dating back to 1912, St. Mary's Catholic Church serves the local Roman Catholic community in the downtown district. With regular parish services in both English and Spanish, St. Mary's measures in at more than 164 feet / 50 meters in height. Founded in 1890, the Sacred Heart certainly ranks amongst the oldest and most historic churches in this part of Indianapolis. Visitors will be sure to admire the twin steeples, which have been extensively restored. The St. John the Evangelist Catholic Church was first completed in 1871, with the actual spires being added some 20 years later. Known for being the highest church in the Central Business District (CBD), St. John's is also known for its attractive French-Gothic style architecture and in 1980 was added to the National Register of Historic Places. The St. Joan of Arc Catholic Church dates back to 1929 and is an important Roman Catholic building in the city, being located within the northerly Oliver Johnson's Woods district. The St. Joan of Arc School is close by, while Tarkington Park is just a few blocks away, to the southwest.